Caught in the middle. Lenovo chose AMD APU's Richland generation for the new G505s series. 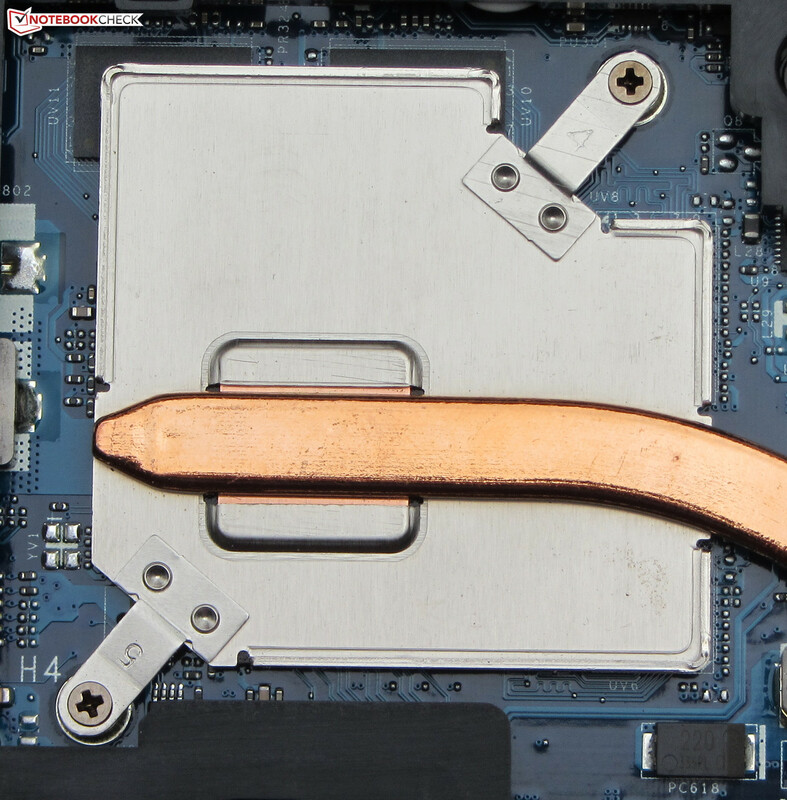 In addition, there is also a dedicated Radeon GPU in the notebooks so that the two graphic cores are working in a Crossfire connection. It sounds like Lenovo is offering a notebook for the economical gamer. Our test determines whether that is true or not. 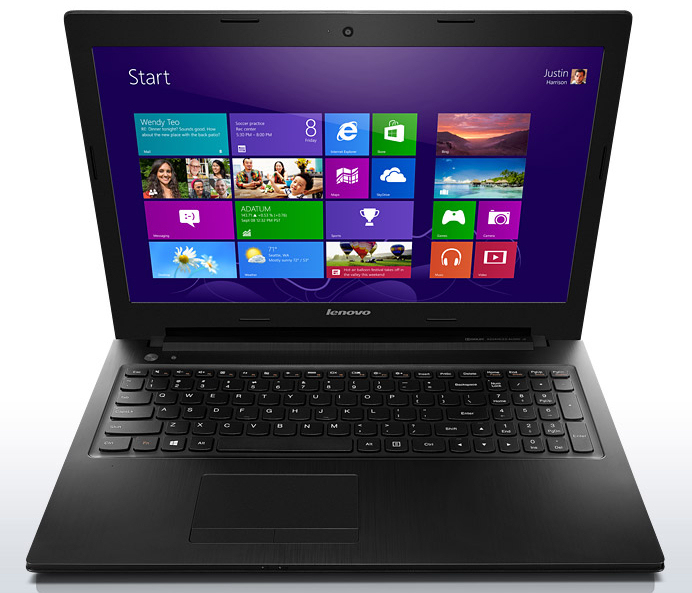 Lenovo extends its already vast selection of cheap notebooks with another series. The G505s series is based on AMD APUs and GPUs. If the G505s rings a bell, then you are not mistaken. The G505s series corresponds to the G500s series. However, the latter uses Intel chips instead. 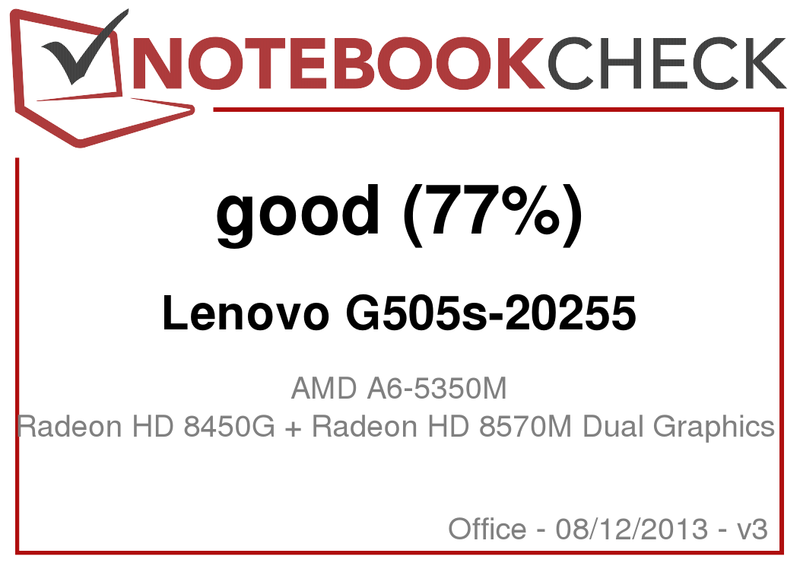 We have tested a notebook of the G500s series (Pentium 2020M, HD Graphics) very recently. 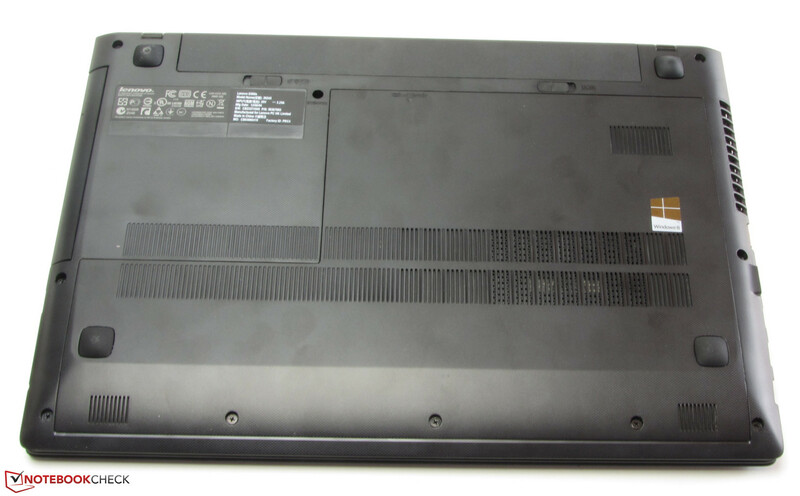 To classify the notebook, we look at the competitors HP Pavilion Sleekbook TouchSmart 15-b153sg (AMD A4-4355M, Radeon 7400G) and Acer Aspire E1-571G (Core i3-3110M, GeForce GT 620M). In this test, we will not go into the details of case, ports, screen, peripheral devices or speakers, since the G505s and the G500s have the same components. Evaluation and description of these components can be seen in the test of the Lenovo G500s. 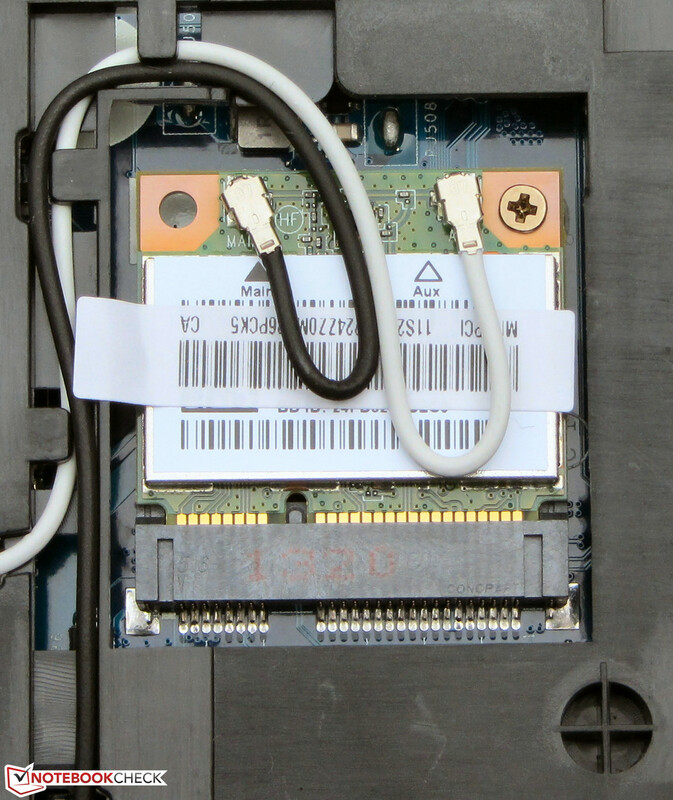 Access to the hardware is possible without any problems, since Lenovo integrated a big maintenance hatch. Behind the hatch, there is the hard drive, the RAM, the fan, the WLAN adapter, the APU and the dedicated GPU. Removing the fan for cleaning is possible. People who have the basic knowhow can also swap the APU. The G505s comes with two RAM slots, just like the G500s. 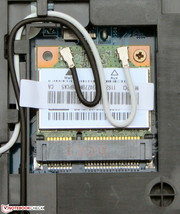 One of the slots is occupied by a 4 GB module. The hard drive can easily be swapped. 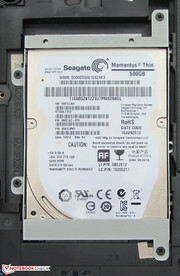 It is possible to use both hard drives with 7 and 9.5mm thickness. Further information for the maintenance and for swapping parts can be found in the accompanying Hardware Manual. This handbook not only covers the G505s, but also the G500s. The memory modules of modern APUs and CPUs support the so-called dual-channel mode. 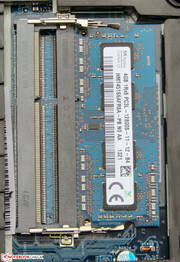 If there are two RAM modules installed in a computer, then they can be used simultaneously. This profits the whole system because optimally used the CPU and/or the integrated GPU give better results. At the same time, the frame rates of games would also increase. When the dual graphic mode is activated, the benchmark scores of the G505s are not increased through the dual-channel mode. When the dedicated GPU is disabled and only the APU used, then the graphic performance increases. 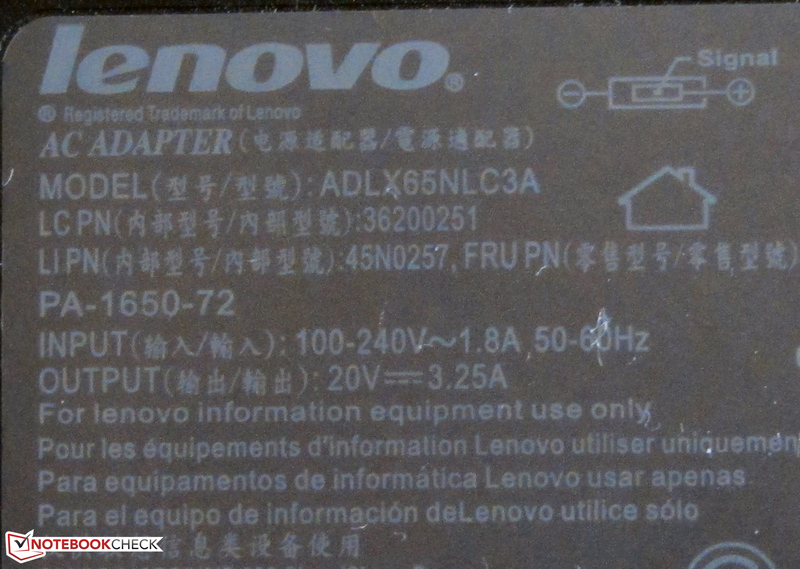 Lenovo has installed Windows 8 (64-bit) on the G505s. 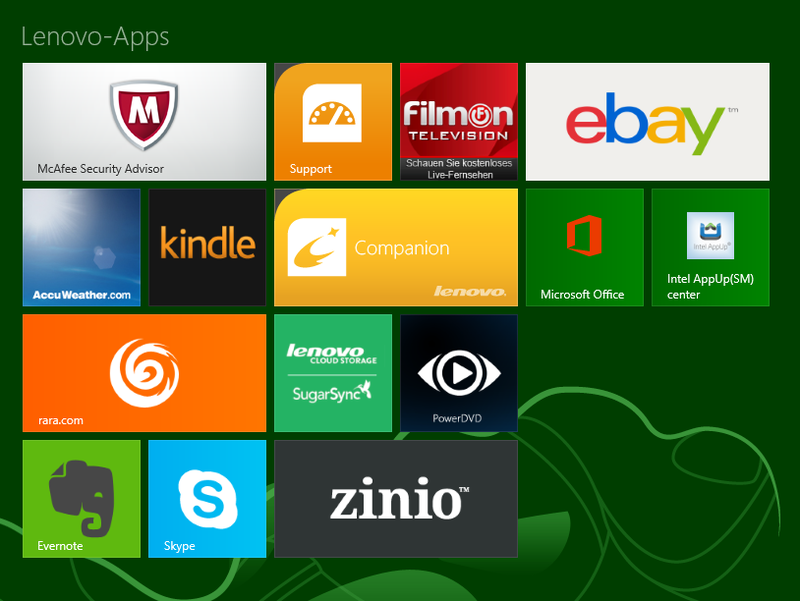 A Windows-8-DVD is not included. 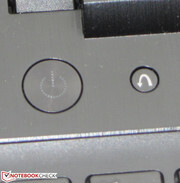 Lenovo has set up their own system for repair and recovery, the so-called One-Key-Recovery-System. 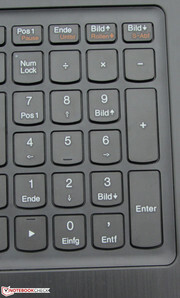 It is launched by pressing the One-Key-Recovery button when the notebook is turned off. This button is placed right next to the power button. When pressed, the notebook turns on and shows a menu. Here, the option "System recovery" can be chosen. The same menu also gives access to the BIOS. Using Windows 7 on the G505s should not be a problem. Lenovo provides suitable drivers. 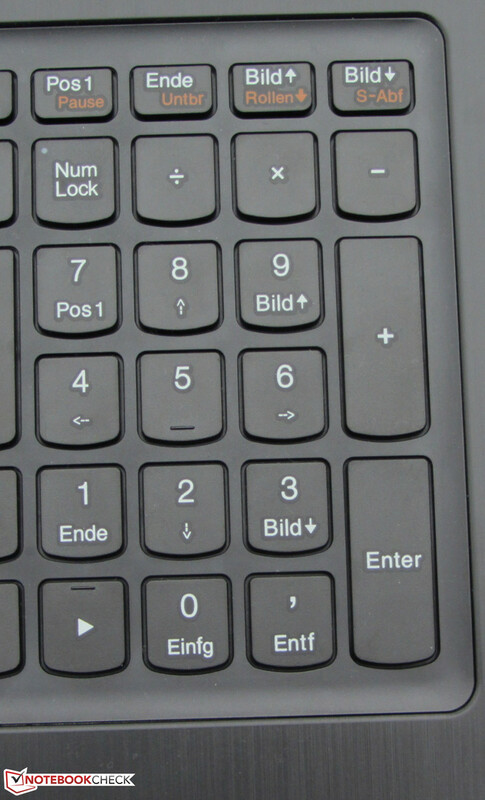 The G505s has the same Samsung panel as the Lenovo G500s. Consequently, the statements about the G500s display also hold for the G505s. The customer gets a simple notebook with an AMD APU and dual graphics solution for the price of about 420 Euros (~$560). Although AMD dual graphics sound very promising, the G505s does not perform well when it comes to computer games. However, it can manage daily tasks without any problems, including office work, Internet communication and video playback (even Full HD videos). At the time of the test, there were two further versions of the series available. People willing to pay about 50 Euros (~$67) more, can buy the same as our test device with 8 GB RAM and a 1 TB hard drive. The third version is equipped with an AMD A8-5550M APU, 8 GB RAM and a 1 TB hard drive. The latter costs about 510 Euros (~$680). 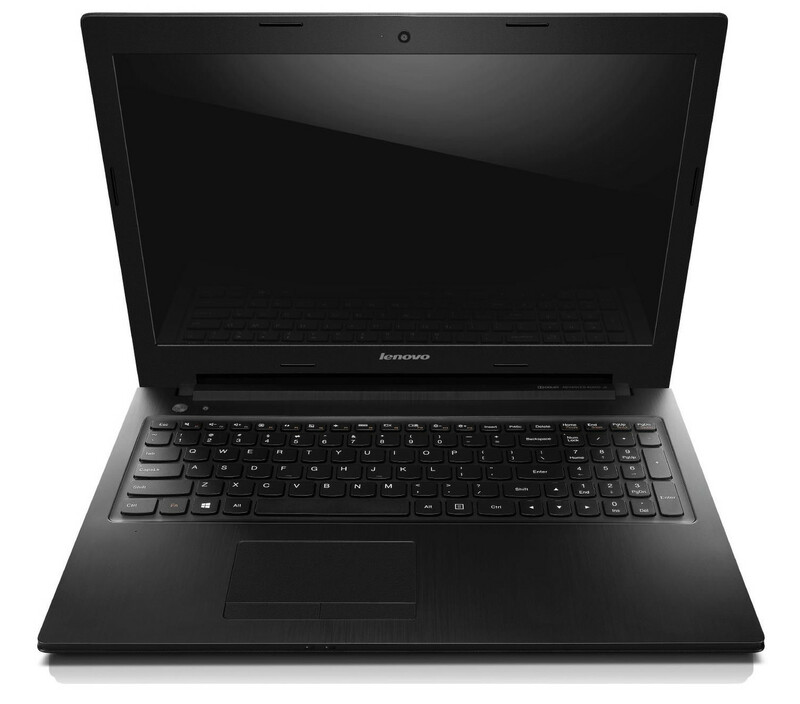 Lenovo has equipped the G505s with an AMD A6-5350M APU that is based on the Richland Architecture. The CPU part of the APU is a dual-core chip working at a base speed of 2.9 GHz. The speed can be increased up to 3.5 GHz (AMD Turbo Core). Thanks to a somewhat faster processing speed, the CPU should perform about 15% better than its predecessor AMD A6-4400M (Trinity). 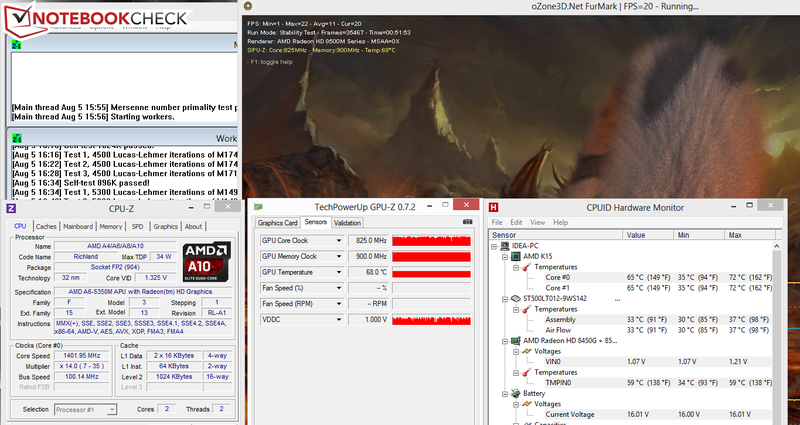 AMD gives a TDP of 35 Watts for the A6-5350M APU. The CPU test of the Cinebench benchmarks tries to get the CPU to work with 3.5 GHz. This usually works for the single thread tests. Only occasionally the cores are throttled to the range of 1.4 up to 3.4 GHz. In the multithread tests, the throttling occurs more often. The Pavilion (AMD A4-4355M, Radeon 7400G) is beaten in all tests. That is not very surprising as its chip is clocked much lower. Both notebooks cannot keep up with the Aspire (Core i3-3110M, GeForce GT 620M). It has the strongest CPU. All three notebooks perform similarly in the Cinebench 10 GL tests. In Cinebench R11.5 the G505s delivers the best values. The System works more or less flawlessly and well. Nonetheless, there are lags when starting applications. There is a noticeable time difference between the clicking and the actual start of an application. We believe that the reason for this lies in the Windows installation. The scores in the PC Mark benchmarks are not that good. The Pavilion (AMD A4-4355M, Radeon 7400G) is surpassed because its specs are overall weaker than the ones of the G505s. However, both do not come anywhere near the scores of the Aspire (Core i3-3110M, GeForce GT 620M). One possibility to improve the system a bit would be to put in a Solid State Disk. The system performance is more agile and faster overall. Moreover, Windows starts up faster too. Furthermore, this has a beneficial effect on PC Mark benchmarks as well. Our Solid State Disk (Crucial RealSSD C300 - 64 GB) increased the PCMark 7 score by just under 103% to a total of 2823 points. 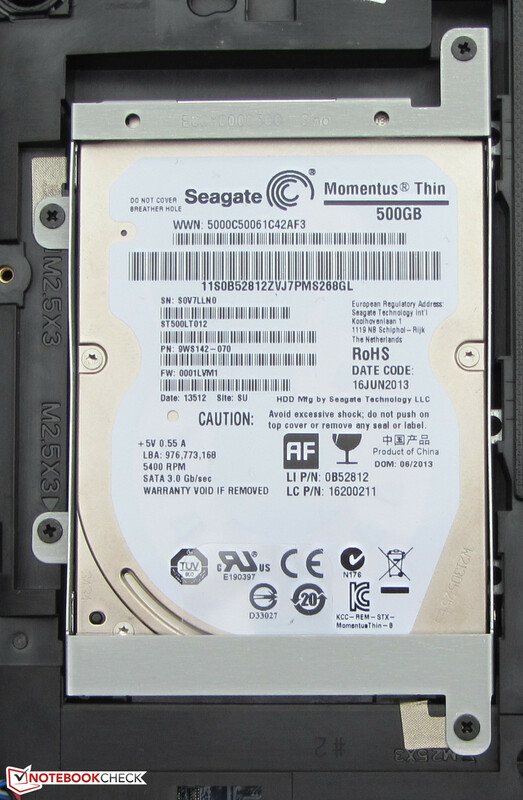 The G505s has a built-in hard drive from the Seagate Momentus Thin Series. It has a capacity of 500 GB and runs at 5400 rpm. CrystalDiskMark yields a read speed of 102.6 MB/s. HD Tune gives an average transfer rate of 87.8 MB/s. These are very good values for a 5400-rpm hard drive. Lenovo chose an AMD Dual graphics solution. Two graphic cores work on the calculation of the pictures (AMD Crossfire). The combination consists of the integrated Radeon HD 8450G graphic core and the dedicated Radeon HD 8570M GPU. Both graphic chips support at least DirectX 11. Both graphic cores do not work simultaneously all the time, e.g. when playing a DVD. When only the integrated GPU is active, then less energy is consumed. Nonetheless, it would be possible to use the dual graphics solution for all the tasks. Dual graphic is also available when in battery mode, but then not at full power. In the GL test of Cinebench R11.5 this results in a score of 11.92 points in battery mode. Whether the dual graphics mode is used, is chosen via profiles that are included with the driver. If a profile intends to use dual graphics, then this is automatically enabled as soon as the application in question is started. The profiles can be changed by the user. Moreover, it is possible to set up the driver in a way that it also uses dual graphics when no profile is available for a given application. The results in the various 3D Mark benchmarks are not very impressive. Notebooks where the Radeon HD 8570M GPU is working by itself, deliver better results, e.g. the Samsung Series 7 Ultra 730U3E-S04DE (Core i5-3337U, Radeon HD 8570M). Here, the weak AMD CPU is noticeable. The Pavilion (AMD A4-4355M, Radeon 7400G) can be beaten. There is only an integrated GPU at work after all. 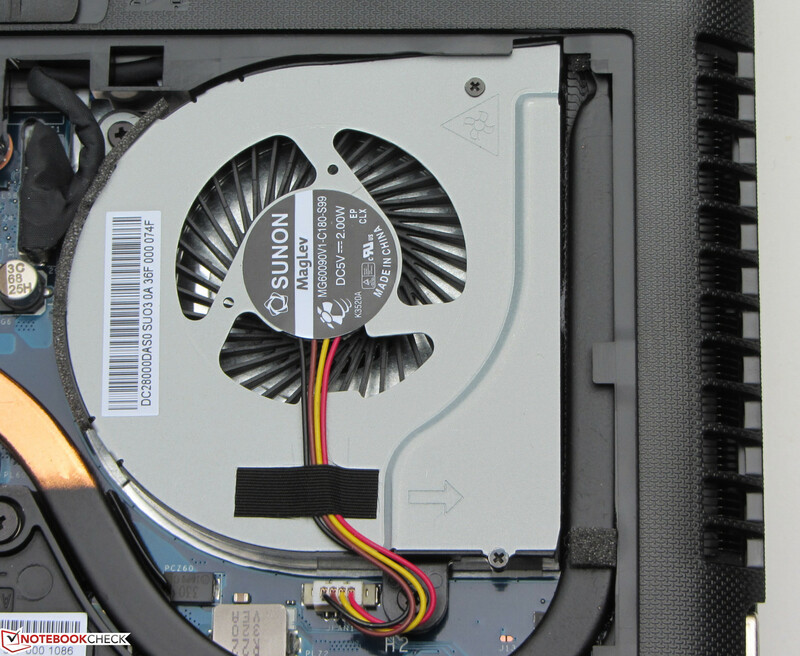 However, the G505s cannot reach the scores of the Aspire (Core i3-3110M, GeForce GT 620M). This is not surprising either as it has the better CPU-GPU combination. Additionally, we have also run the 3D Mark benchmarks with the GPU deactivated (only the graphic core of the APU enabled). The dual graphics solution yields better results in the benchmarks than the integrated GPU alone. In practice, for instance in games, the opposite is the case though. 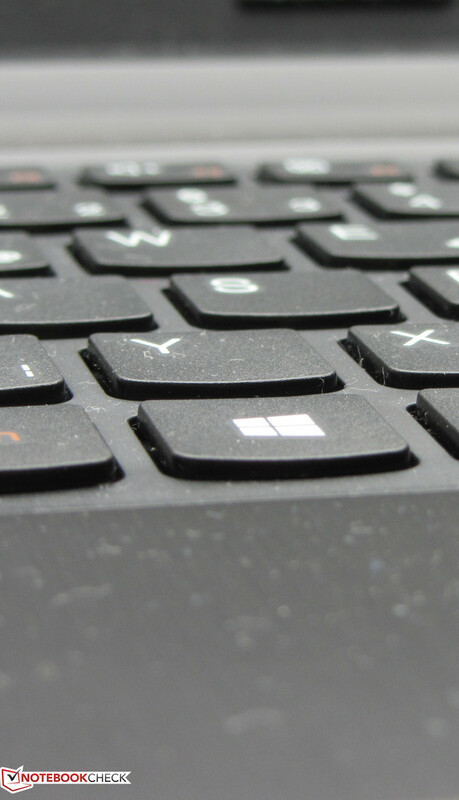 People looking for a gaming capable notebook had better continue their search. The G505s can play a few current 3D games smoothly, but only when low resolution and low quality settings are chosen. For older games and games with only low system requirements, like the FIFA series or Diablo 3, higher resolutions and quality settings are also possible. The AMD dual graphics solutions are known for the issue that micro lags can occur around 30 fps. This was also observed in the case of the G505s. We have also tried many games while the GPU was disabled (only graphic chip of the APU enabled). There is no clear result here. Often the dual graphics solution delivers higher frame rates. In some cases, there are no noticeable differences. In some cases, the dual solution also delivers lower frame rates in comparison. 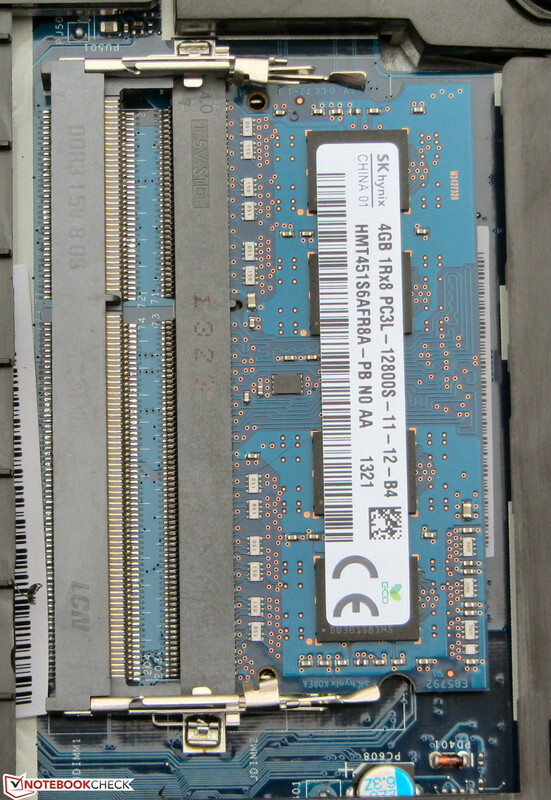 We tested the integrated graphic core one more time: this time we put a second RAM module into the computer so that the RAM is working in dual-channel mode. The frame rates of the games we tested increased by about 20% on average (Anno 2070: 19%, Tomb Raider: 17.8%, Bioshock Infinite 22.9%, Skyrim: 18%). If gaming is an important point, then the Aspire is more recommended, since it delivers better frame rates. It costs about 450 Euros (~$600) at the moment, and hence only a little more than the G505s while delivering better CPU and GPU performances. Alternatively, one can also buy its variant, the G500s. That notebook is also available in configurations with a GeForce GT 720M GPU. Such a model with Core i5-3230M chip costs about 520 Euros ($694) at the moment. The G505s works with very little noise in idle mode. We have measured a sound level between 29.9 and 31.6 dB(A). 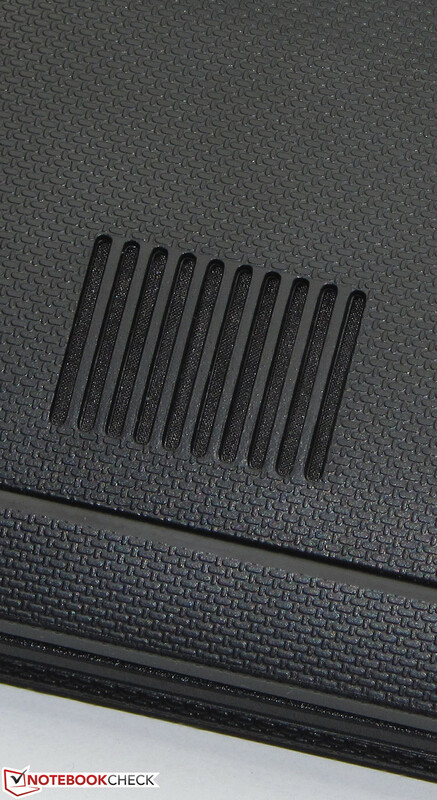 The Pavilion (29.6 dB(A)) and the Aspire (31.2 up to 32.5 dB(A)) also work with very little noise. Under medium (3D Mark 06 running) and full load (Stress test, Prime95 and FurMark running), the G505s does not produce much noise either. The measurements gave values at 36.3 and 36.8 dB(A), respectively. The Pavilion is at a similar level (34.9 and 38.3 dB(A)). For the Aspire (37.7 and 43.2 dB(A)) the values are higher. The G505s does not have any heat problems in idle mode. The temperatures stay under 30 degrees Celsius (86 degrees Fahrenheit). 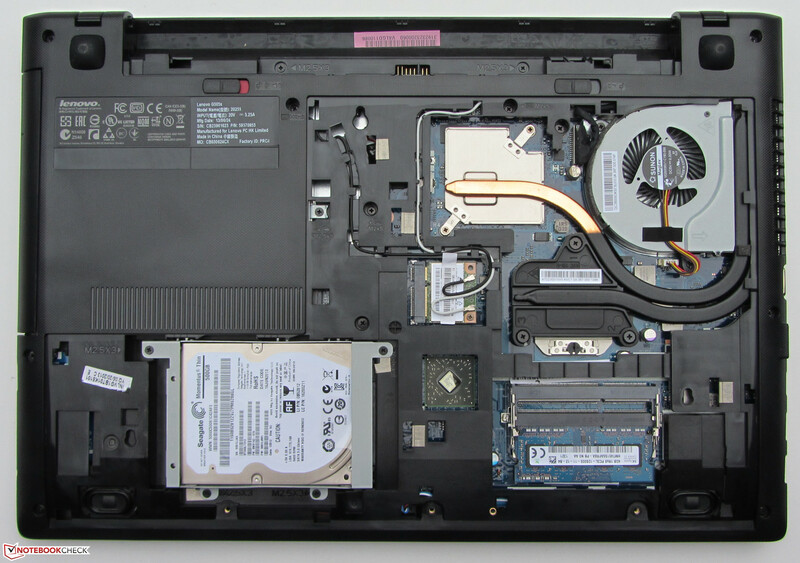 The Pavilion and the Aspire notebooks work at similar low temperatures. The values of the G505s rise to levels of 28.1 up to 44.6 degrees Celsius (82.58 up to 112.28 Fahrenheit) under full load. The values over 40 degrees (104 Fahrenheit) are measured in the area around the fan. The two competitors do not get quite as hot. All three computers allow for comfortable work, since their palm rests never heat up excessively. The Stress test (Prime95 and FurMark running for at least one hour) is performed by the CPU with permanently changing speeds. The speed of the two cores varies all the time between 900 and 3,500 MHz. All the intermediate levels are being used as well at that time. The dedicated GPU performs the Stress test with 750 to 825 MHz, the integrated GPU works with 351 to 533 MHz. If the Stress test is performed while in battery mode, then the changing of the speed does not occur. The CPU speed stays constantly at 2.9 GHz. The dedicated GPU works with 400 MHz, while the integrated graphic core is running at 253 MHz. The CPU temperature settles at about 65 degrees Celsius (149 Fahrenheit) when not in battery mode. We started the 3D Mark 06 Benchmark again right after the Stress test. Then the score was lower than in the cold state of the notebook with a total score 3,639 points. The turbos of the CPU and GPU are used more sparingly at higher temperatures so that the 3D Mark scores are lower. In practice, this would mean that the frame rates of video games would be a bit lower when the notebook is getting too hot. (±) The average temperature for the upper side under maximal load is 36.5 °C / 98 F, compared to the average of 29.4 °C / 85 F for the devices in the class Office. (±) The maximum temperature on the upper side is 42.5 °C / 109 F, compared to the average of 33.9 °C / 93 F, ranging from 21.2 to 62.5 °C for the class Office. (+) In idle usage, the average temperature for the upper side is 27.8 °C / 82 F, compared to the device average of 29.4 °C / 85 F.
(±) The palmrests and touchpad can get very hot to the touch with a maximum of 38.1 °C / 100.6 F.
(-) The average temperature of the palmrest area of similar devices was 28.2 °C / 82.8 F (-9.9 °C / -17.8 F). The energy consumption of the G505s in idle mode is very low with only 6.6 up to 10 Watts. The same also holds for the Pavilion (6.9 up to 10.1 Watts). The Aspire (9.7 up to 11.5 Watts) is a bit more thirsty. The amount increases under medium load (3D Mark 06 running) or full load (Stress test, Prime95 and FurMark running) to 37.7 and 41.7 Watts, respectively. These values are in a similar range because under full load the CPU and GPU chips do not work with full power. This is also the case for the Pavilion (26.6 and 29.3 Watts). The Aspire (48.8 and 55.4 Watts) does not have this problem; hence, the energy consumption ends up being much higher in return. The G505s shows great endurance in the idle mode with a battery run time of 8:26 h. The Aspire (8:20 h) is as good, but the Pavilion (4:46 h) turns off a lot earlier than that. The idle mode is being tested by the Battery Eater Reader’s Test: the screen is running on the lowest of all brightness levels, the energy profile is activated, and all wireless modules are deactivated. Under full load, the G505s reaches a run time of 1:20 h. Both the Aspire (1:51 h) as well as the Pavilion (2:04 h) offer better run times under these conditions. The Battery Eater Classic Test is used to measure the battery run time under full load. It sets the screen to the highest level of brightness, enables the high-performance profile and activates all the wireless modules. The G505s finishes the WLAN test after 3:36 h. This time puts it in the middle between the Pavilion (3:09 h) and the Aspire (4:27 h). The test automatically opens websites in 40-second intervals. The energy profile is active and the display brightness is set to 150 cd/m². The DVD playback finishes after 3:15 h on the G505s. The Aspire (3:46 h) lasts a bit longer again. The Pavilion does not have a DVD drive. The DVD test is performed with the energy profile activated (or a higher profile, if the DVD cannot be run smoothly), highest screen brightness, and deactivated wireless modules. 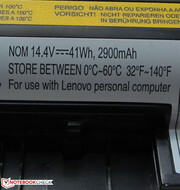 The battery run times of the three devices can be compared to a limited extent. 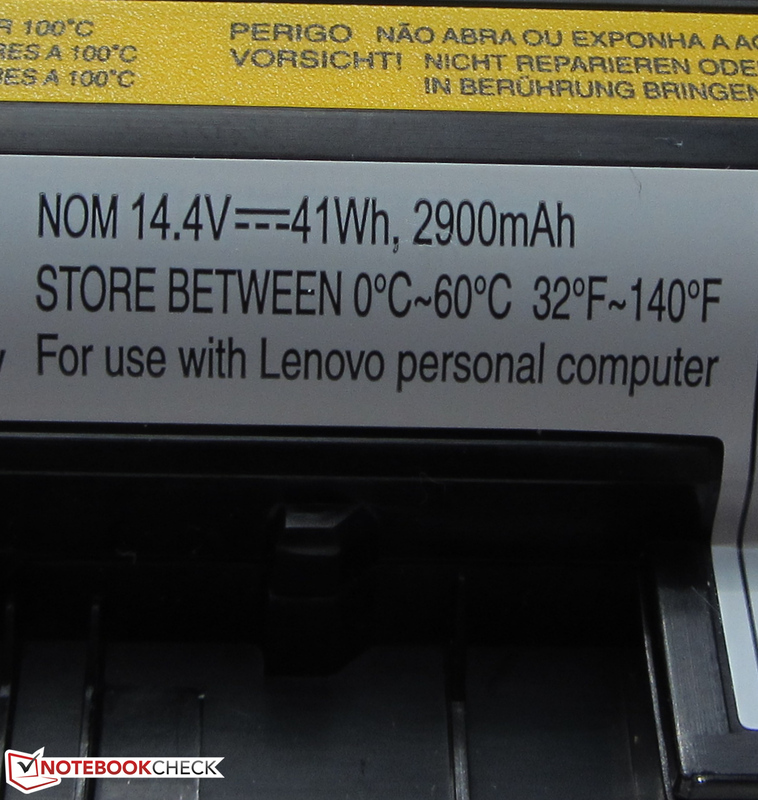 The capacities of their batteries are all in a similar range (Lenovo: 41 Wh, Pavilion: 37 Wh, Aspire: 44 Wh). 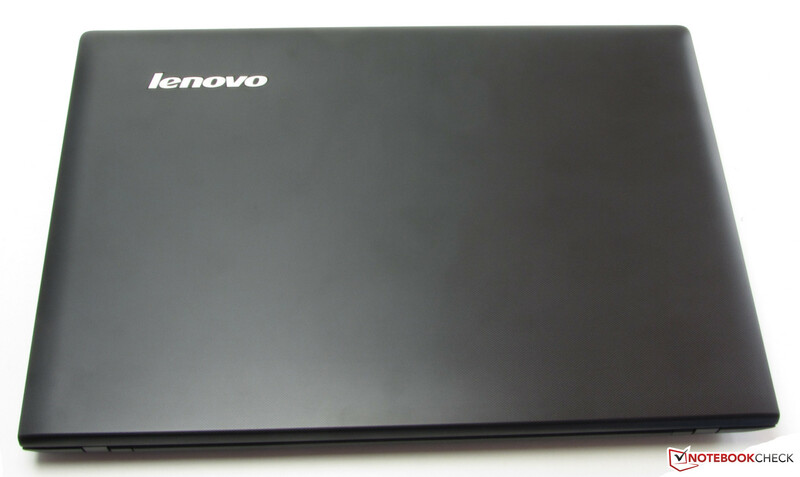 The Lenovo G505s offers sufficient power to perform most of the tasks. Moreover, the device does not get very warm in idle mode and uses energy economically. In addition, the notebook works at a very low noise level throughout the workload. The two-year warranty is another plus. 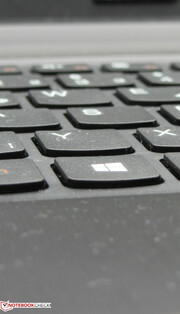 On the other hand, the keyboard is a step back compared to earlier models from Lenovo. The screen contrast is too low. Furthermore, the case could be more robust. The frame rates in computer games are also fairly low. The dual graphic system does not manage to produce smooth frame rates for many games. Overall, the G505s is not really convincing. 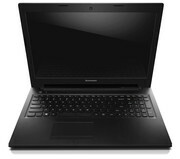 It offers much less CPU performance than many cheaper Intel powered notebooks, such as the Lenovo G500s or the Wortmann Terra Mobile 1512. At the same time it also does not offer as good an application and game performance as many similarly priced notebooks, such as the Acer Aspire E1-571G. Hence, it is hard to find a reason to buy the G505s. The Acer Aspire E1-571G is best for people who are looking for a good application and game performance at a relatively low price. 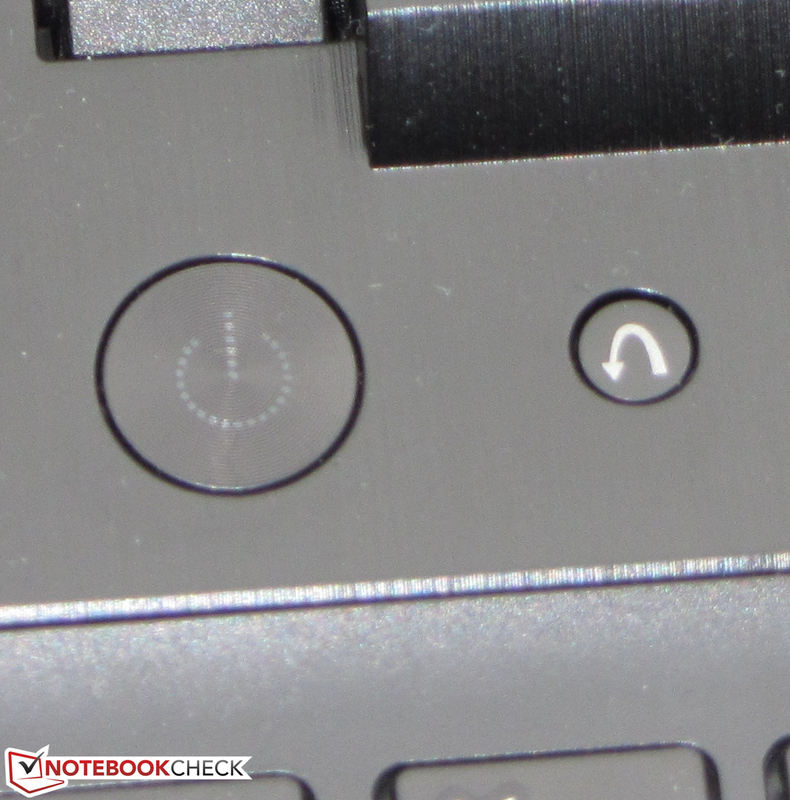 The HP Pavilion Sleekbook TouchSmart 15-b153sg is interesting when looking for a thin notebook with a touchscreen. The back side of the cover is textured. A maintenance hatch is provided. The DVD burner can read and write all DVDs and CDs. The hinges hold the cover firmly in place. There are two memory slots available. Swapping hardrives would be no problem. The APU can be swapped. The Radeon HD 8570M GPU is soldered in place. Good: There are two WLAN antennas in place. ...and offers a maximum performance of 65 Watts. 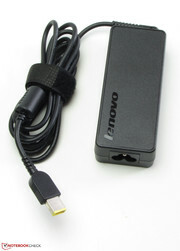 ...and offers a capacity of 41 Wh. 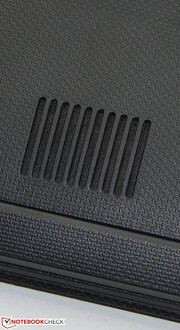 The speakers are located at the bottom of the device. The keys have a short stroke. 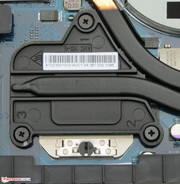 The One-Key-Recovery-Button (on the right) launches the recovery system and grants access to the BIOS. The G505s includes a variety of apps. A better display and a better keyboard. Even the dual-graphics solution does not really make the G505s a gaming capable notebook. 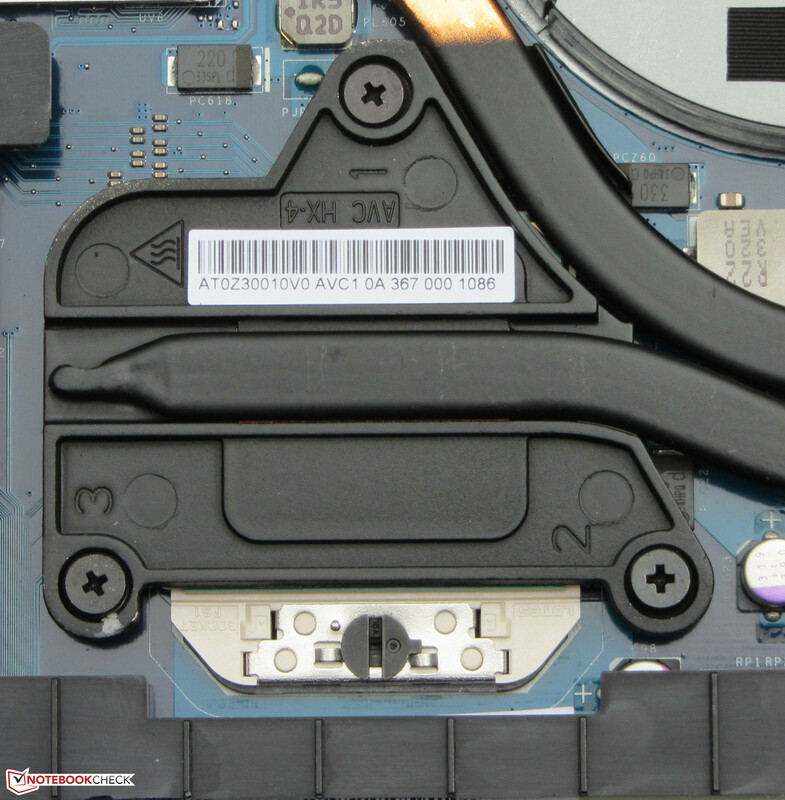 Therefore, it does not make sense to us that Lenovo has installed a second graphic chip.